A study epublished in November 2016 reported children with autism spectrum disorders (ASD) who receive vitamin D3supplements experience an improvement in symptoms. While other studies have found that vitamin D deficiency is common in children with ASD. This double-blind, randomized clinical trial (RCT) included 109 boys and girls 3 to 10 years old with ASD. In these subjects, researchers evaluated the effects of supplementation with vitamin D on primary symptoms of autism. The children were randomly divided to receive 300 IU vitamin D3/kg/day, not to exceed 5,000 IU/day, or a placebo for 4 months. At baseline and at the end of the study, the investigators measured serum levels of 25-hydroxycholecalciferol (25(OH)D). They also evaluated autism severity and social maturity by using the Childhood Autism Rating Scale (CARS), Aberrant Behavior Checklist (ABC), Social Responsiveness Scale (SRS), and the Autism Treatment Evaluation Checklist (ATEC). Total CARS scores significantly declined in the group given vitamin D compared with scores in the placebo group, indicating an improvement in ASD symptoms. In particular, significant improvements were noted in the capacity to relate to people, emotional response, imitation, body use, object use, adaptation to change, listening response, visual response, and general autistic impression. Children given vitamin D also demonstrated a pronounced improvement in ABC subscale scores compared with children given placebo. Statistically meaningful improvements occurred in irritability, hyperactivity, social withdrawal, stereotypical behavior, and inappropriate speech. Total mean SRS scores improved in the vitamin D group. At the study’s conclusion, children receiving vitamin D demonstrated marked improvements in SRS subscale scores involving autistic mannerism, social cognition, and social awareness. There were no significant differences between social communication and social motivation in the vitamin D group compared with the placebo group. Vitamin D supplementation resulted in statistically significant improvements in ATEC scores, including subscale scores for sociability, cognitive awareness, and behavior. 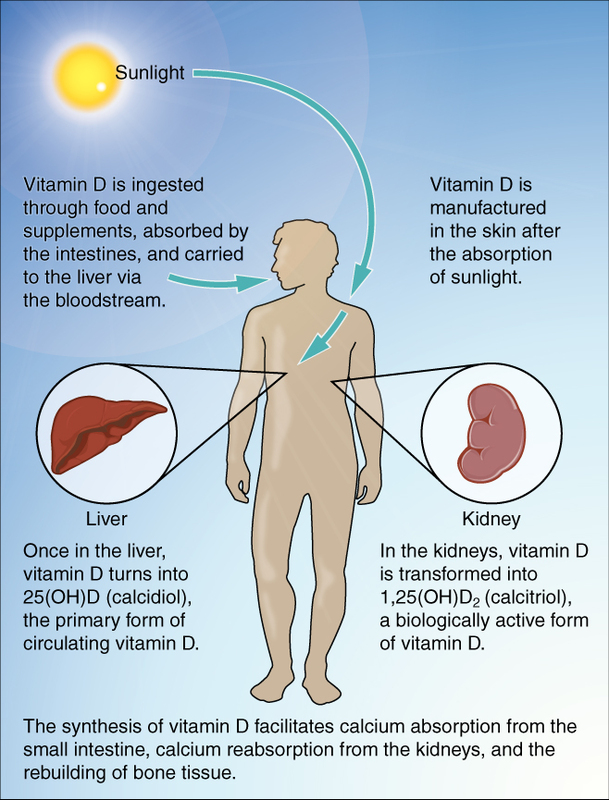 This image shows how we produce Vit D from sunlight, with the help of our skin, liver and kidney. Vitamin D can be synthesized in the skin upon exposure to sunlight and is then metabolized in the liver and kidney to the metabolically active form called 1,25-dihydroxyvitamin D. Through binding to the vitamin D receptor (VDR), 1,25-dihydroxyvitamin D can regulate the expression of hundreds of genes involved in skeletal and other biological functions. Vitamin D is essential for maintenance of bone mineralization through the regulation of calcium and phosphorus homeostasis. Vitamin D also exhibits many non-skeletal effects, particularly on the immune, endocrine, and cardiovascular systems. Vitamin D is important for normal bone development and maintenance. Severe vitamin D deficiency causes rickets in children and osteomalacia in adults. Secondary hyperparathyroidism due to vitamin D insufficiency can increase bone breakdown and precipitate osteoporosis. Randomized clinical trials indicate that high doses of supplemental vitamin D can reduce the risk of falls and fractures in older individuals. Vitamin D can regulate cell differentiation and growth by binding to the vitamin D receptor found in most body cells. Observational studies have reported associations between low sun exposure, poor vitamin D status, and increased risk of developing colorectal and breast cancer. Randomized clinical trials are needed to evaluate whether cancer prevention may benefit from vitamin D supplementation. Various observational studies have reported an association between vitamin D status and the susceptibility or severity of autoimmune diseases, including type 1 diabetes mellitus, multiple sclerosis, rheumatoid arthritis, and systemic lupus erythematosus. 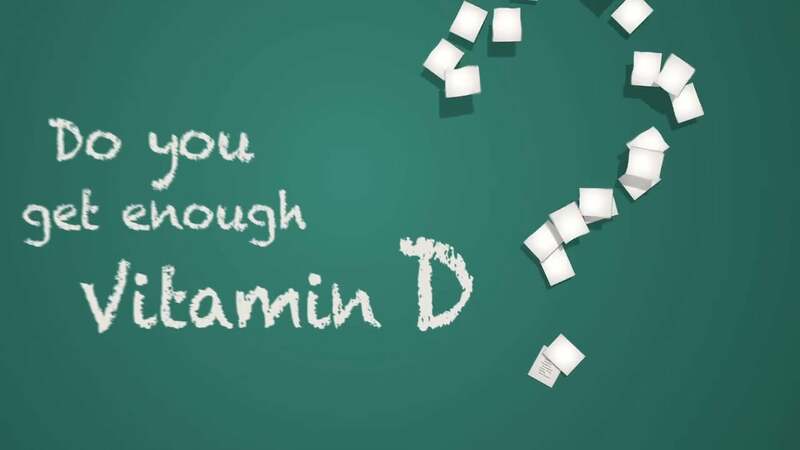 Current evidence from observational studies suggests an inverse relationship between circulating vitamin D concentrations and risk of type 2 diabetes mellitus. It is not yet known whether correcting vitamin D deficiency in individuals with glucose intolerance can decrease the risk of progression to type 2 diabetes. Randomized clinical trials are currently investigating whether vitamin D supplementation can limit cognitive deterioration and disease progression in subjects with neurodegenerative disease. Vitamin D insufficiency in pregnant women may be associated with several adverse effects for the mother and newborn. Safety and benefits of vitamin D supplementation during pregnancy both need to be evaluated in clinical trials. Recent preliminary studies have shown that vitamin D supplementation may offer promising improvements in the management of atopic dermatitis (eczema) and Crohn’s disease. Saad K, et al. J Child Psychol Psychiatry. Nov 21, 2016.